Es stand bereits in der "HiFi-Stereo review" von 1962 . . .
. . . . was es mit der Plattenqualität der 30cm Langspielplatte so auf sich hat. Sie wußten es also alle, (die es wissen wollten oder mußten) daß da einiges im Argen lag. Wie der amerikanische Autor David Hall ausführt, gab es bis 1948/49 keine so großen Probleme mit der 78er Schellackplatte, weil die Audio-Qualität sowieso enge Grenzen hatte. - Als aber 1948/499 die 33er LP und die 45er Single (beide in Mono) nahezu zeitgleich auf den Markt kamen, kamen die Techniker und Ingenieure sehr schnell dahinter, daß es bei der 33er LP erhebliche Probleme ab der Mitte des nutzbaren Rillenbereiches dieser großen Platte gab. Und die propagierte Qualität bei der (ab etwa 1958) ganz neuen 33er Stereo LP ließ sich auch nur bis zur Mitte (Hälfte) des Duchmessers einhalten. Danach - also zur Platten-Mitte hin - wurde es ziemlich schlimm. Mitte oder Ende der 1970er Jahre wurde den Discjockeys in den Diskotheken die Maxi-Single als der letze Schrei angedient, noch besser und noch lauter sollte es gehen. Daß das alles ein alter Hut war, stand damals nirgendwo, auch nicht in der Fachpresse. Einig war man sich darüber, daß mit steigender Abspielgeschwindigkeit die Wiedergabe-Qualität deutlich besser war, sofern es die billigen Abtastsysteme in den damaligen Lenco L75 Disco-Plattenspielern überhaupt "konnten". In diesem Artikel wird auf die Schwächen der neuen Stereo-LPs mit 33 1/3 U/min deutlich eingegangen und es wird ausführlich die gesteigerte Qualität dieser 45er LPs (auch mit 12 Zoll oder 30cm Durchmesser) beschrieben. Und es war erst Oktober 1962. AND NOW - "45-rpm - 12-inch" records ! Anmerkung : Es müssten demnach die ersten dem amerikanischen Autor in 1962 vorliegenden 12" LPs mit der höheren Geschindigkeit der 17cm Singles gewesen sein. The latest thing on the recordings scene involves the resurrection (Auferstehung, Wiederbelebung) of the 45-rpm speed for concert music, with the records being released in stereo on standard 12-inch (30cm) discs rather than in the familiar large-center-hole format. Two new record companies, Connoisseur Society and Quarante-Cinq, are the leaders in this field, and both claim for their discs a freedom from distortion, especially of the inner-groove variety, and a range of audio frequencies and dynamics superior to that of today's 33/3-rpm discs. This type of reasoning makes sense if one bears in mind that a major recording problem is in transferring information from master tape to disc. Clearly a 33 1/3-rpm (rounds per minute) disc must cram (vollstopfen) more information into each linear inch of its grooves than does one that revolves at the faster 45-rpm speed. In the days of mono phonic recording (Anmerkung : Das war die Zeit von etwa 1949 bis 1958), the tapc-to-disc transfer could be done with a high degree of accuracy at the 33 1/3-rpm speed, but there was still the problem of inner-groove distortion. 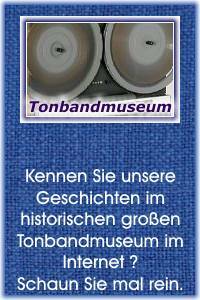 The further the groove went toward the center of the record, the more information had to be packed into a steadily decreasing (konstant abnehmend) linear distance because of the geometry of the spiral-groove system. Der Trick mit der geänderten "Entzerrung"
The high-frequency losses encountered (auftreffend) during the course of the final five minutes of a 33 1/3 rpm record could be compensated for by progressively boosting the high frequencies during the cutting process, but only at the cost of distortion and over-all recording level. Anmerkung : Man hatte daher ab der Hälfte des Durchmessers der 30cm Scheibe die Höhen sowie den Pegel nochmals angehoben, aber auf Kosten der gestiegenen Verzerrungen und des erhöhten Pegels. For stereo, the grooves have to contain added information, causing inner-groove distortion to be even more critical than for mono. Inner-groove deterioration sets in sooner and is more offensive on stereo than on mono, and in the early days of the stereo disc (1957/1958), it was all but impossible to record on a stereo disc a dynamic range (Dynamik-Bereich) comparable to that of the best monophonic records. Thus, given a flawless master tape to work from, it is reasonable (realistisch) to suppose (anzunehmen) that the faster speed for stereo could yield a superior result, particularly if the maximum time on a side were kept within the 18 to 21-minute range. This, in effect, is the argument offered by the proponents (Beführworter) of the 45-rpm speed. At this point we shall turn from theory to practice, to an examination of seven new 45-rpm releases. Die Labels "Connoisseur Society" und "Quarante-Cinq"
From Connoisseur Society there are two discs, "Flute Concertos of Eighteenth-Century Paris" (CS 362) and "Ustad Ali Akbar Khan - Master Musician of India" (CS 462), each priced at §6.98. Quarante-Cinq offers five records: "Bravo Toro" (45002); Otto Ackermann's interpretation of Strauss's Til Eulenspeigel and Don Juan (45003) ; Pierre Michel Leconte and Pierre Dervaux conducting music by Chabrier, Weber, and Adam (45001) ; and Walter Goehr's readings of Stravinsky's Firebird Suite and Falla's El Amor Brujo (45004) and Tchaikovsky's Sleeping Beauty Suite and the Swan Lake Suite (45005) - all priced at $5.98. Nachtrag : Das Label "Quarante-Cinq Records" war eine "division of: Audio Reproductions Inc." - 333 Sixth Ave - New York 14 - N.Y.
Regrettably, the five records from Quarante-Cinq can be disposed of in fairly short order. The Richard Strauss, Tchaikovsky, and Falla-Stravinsky discs all derive from master tapes recorded in the middle 1950's by Concert Hall Society, and were made available by that organization on 7 1/2-ips prerecorded tapes in the days before stereo discs and four-track tapes took over. These recorded performances have little to offer either in the way of musical distinction (when compared to what is available on 33 1/3-rpm stereo discs today) or in sonic quality. The Chabrier and "Bravo Toro" discs offer somewhat better sound, although it is not really exceptional; and both are musically excellent. Pierre Michel Leconte's Chabrier performances are full of verve and pepper, especially in the Marche joyeuse. The "Bravo Toro" collection of Spanish bullfight music is a spendid example of the genre, played with lots of spirit and with first-rate intonation. Nevertheless, I question the justification of the $5.98 price asked for these discs, considering the quality and origin of the master tapes. It is when we turn to the Connoisseur Society discs that we can legitimately discuss the merits of the 45-rpm 12-inch stereo disc as a vehicle for superior recorded sound. One thing is clear at the outset : that anyone who invests $6.98 in these discs will get his money's worth; for it is evident from the elegant packaging, the beautiful performances, and the crystal-clear recorded sound that Connoisseur Society has made a genuine effort to produce the finest record that can be made with present-day recording equipment. The master tape was recorded on two quarter-inch tracks at 30 inches per second as opposed to the usual three narrower tracks at 15 inches per second. The discs, furthermore, have been cut directly from the original master tape rather than from the usual copy. What results is a combination of presence, frequency range, and dynamic range equalled by only a very few of the finest 33 1/3-rpm stereo discs and surpassed by none that I have heard. Musically, both of the Connoisseur Society discs arc unusual, fascinating, and thoroughly enjoyable. Two little-known eighteenth-century French composers, Joseph Bodin de Boisniortier (1691-1755) and Michel Corrctte (1709-1795), are represented on the flute-concerto discs - Boisniortier by a trio of concertos written for the remarkable combination of five flutes, and Corette by three so-called Concerto comiques for three flutes and continue The players are a veritable roster of who's who in contemporary flutedom, headed by France's top flute virtuoso, Jean-Pierre Rampal. Rampal's regular accompanist Robert Veyron-Lacroix and American cellist David Soyer handle the continuo assignment in the Corette pieces with exemplary taste and imagination. The music by these composers is in the best lightweight rococo manner, and yet, in the instance of Boisniortier, it is beautifully crafted. The Boismortier concertos have a wonderfully zephyrous airy-fairy sound, with stereo emphasizing the wealth of anti-phonal give and take between the instrumentalists. Despite the use of only two tracks on the stereo master, the sound has no hole in the middle. The Corvette concertos apparently derive their "comiquc" designation from the use of folk song, and as music they do not strike me as being as interesting as the Boismortier pieces, but they are delightful listening all the same. The recording is particularly commendable considering that flutes in ensemble are notorious for their production of combination tones, usually heard on records (but not here) as a peculiarly unpleasant form of intermoduiation distortion. Connoisseur Society's second disc, the Indian-music recording, poses problems for Western ears, at least initially. A twenty-minute improvisation on an initially stated raga (the Indian counterpart to a western tone-row) may at first seem monotonous, particularly as there are no key changes such as we are used to hearing. This monotony of key is further emphasized by the use of a continual drone instrument in tire background. On the other hand, the melodic line is enriched with a wealth of quarter-tones, glissandos, and incredibly complex interplays of rhythm, usually played on a pair of labia (small hand drums). "Ustad Ali Akbar Khan" plays the sarod, a stringed plectral instrument that sounds something like a cross between a banjo and a Hawaiian guitar, and he is assuredly a master of his instrument. Equally remarkable is the labia playing of Pandit Mahapurush Misra, especially toward the end of side one, where he and Akbar Khan vie with one another in a tremendously exciting question-and-answer episode. Plectral and percussion instruments lend themselves particularly well to stereo recording, and the Indian instruments arc ideal for the medium. Their recorded presence is both insistent and subtle, and as each of the two sides nears its conclusion, the excitement becomes virtually orgiastic. To sum up, Connoisseur Society's initial two records are remarkably fine, and I look forward to future releases from the company. It would perhaps be rash to say that these discs are conclusive proof of the superiority of the 45-rpm speed as a medium for stereo discs, but what they do prove is that the kind of care that has gone into the making of these discs can produce records that will establish standards of excellence for the entire recording industry. Ein Artikel aus Oktober 1962 !! !